ARRB is set to work alongside the Research Institute of Highway (RIOH), Ministry of Transportation, China. 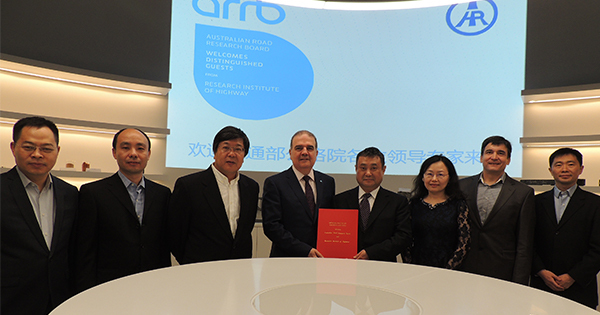 ARRB and RIOH have signed a Memorandum of Understanding to work together on next generation smart materials for a connected and automated future. A delegation from RIOH, led by RIOH President Jinquan Zhang, spent a week in Melbourne in March – most of it visiting ARRB's Port Melbourne headquarters as well as a trip to Victoria’s state road agency VicRoads. As guests of ARRB CEO Michael Caltabiano, the delegation was shown presentations on ARRB’s work on pavement research, Connected and Automated Vehicles and road safety. President Zhang thanked ARRB for its hospitality during the delegation’s stay, and invited ARRB for a reciprocal visit to its Beijing headquarters later this year. ARRB is likely to visit RIOH in June 2019. Click the button below to view the photo gallery of RIOH's visit to Australia.